BRP Ramon Alcaraz is a Philippine Navy Gregorio del Pilar class frigate. 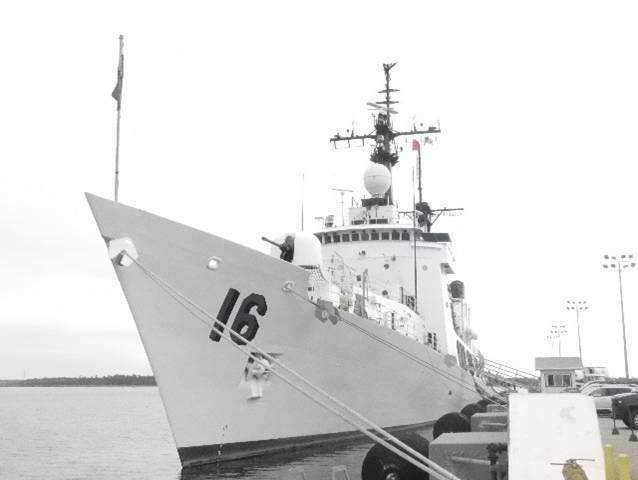 BRP Ramon Alcaraz (PF-16) is a Philippine Navy Gregorio del Pilar class frigate. From 1968 to 2012, it was known as USCGC Dallas (WHEC-716) and served the US Coast Guard as a high endurance cutter. It was decommissioned on 30 March 2012 and was acquired by the Philippines under the Excess Defense Articles and the Foreign Assistance Act. Ramon Alcaraz is the second of several ex-US Coast Guard Hamilton-class cutter that will serve the Philippine Navy. The ship was designed with a high level of habitability and provides fairly comfortable accommodations, including air conditioning. Ramon Alcaraz employs the shipboard application of aircraft gas turbine jet engines with the use of controllable pitch propellers. She is equipped with two 18,000 horsepower (13,000 kW) Pratt & Whitneygas turbines and can propel the ship at speeds up to 28 knots (52 km/h). Ramon Alcaraz also has two 3,500 horsepower (2,600 kW)Fairbanks-Morsediesel engines, capable of driving the ship economically at 17 knots (31 km/h) for up to 14,400 nautical miles (26,700 km) without refueling. A retractable/rotatable bow propulsion unit provides maneuverability in tight situations. The Ramon Alcaraz has a flight deck and hangar capable of handling helicopters. The Philippine Navy officially confirmed the Joint Visual Inspection (JVI) by its officials led by Rear Admiral Orwen Cortez of South Carolina-based Hamilton class cutter USCGC Dallas (WHEC-716) from 31 October to 5 November 2011. The ship was scheduled to be transferred as an excess defense article through the Foreign Assistance Actvia a “hot transfer” on May 2012. The Dallas was formally decommissioned on 30 March 2012, and the US Coast Guard removed the ship’sPhalanx CIWS and 2 Mk.38 M242 Bushmaster 25 mm chain guns, which will be used on their new National Security Cutters (NSCs) and Sentinel-class Fast Response Cutters, respectively. The USCG also removed the AN/SPS-40 air search radar and will be used as spares for remaining Hamilton class ships. On 6 May 2012 during the 70th commemoration of the Fall of Bataan, President Benigno Aquino III announced the naming of the ex-USCGC Dallas to BRP Ramon Alcaraz in honor of the World War II hero and officer of the Philippine Navy. Commodore Ramon “Monching” Alcaraz commanded one of the Philippine Offshore Patrol’s Q-boat Q-112 Abra during World War II which shot down 3 Japanese aircraft. The ex-Dallas was formally transferred to the Philippine government on 22 May 2012 during a ceremony at the Federal Law Enforcement Training Center Pier Papa in North Charleston, South Carolina. The ship was turned over to its Filipino crew, with Capt. Ernesto Baldovino as its first commanding officer. The ship’s crew had been in the US for several weeks prior to the transfer for training aboard other Hamilton class ships operated by the US Coast Guard. The Ramon Alcaraz is scheduled to be refitted at the expense of the Philippine Navy prior to sailing to the Philippines. The ship’s transfer cost was pegged at Php 450 million (around US$10 million as of 2012), while operation costs will be similar to its sister ship, the del Pilar. An additional US$5 million was allocated for installation of additional equipment, different from her sister ship BRP Gregorio del Pilar. The ship will have better fire control and weapons systems than the del Pilar. The ship was originally expected to leave Charleston, South Carolina for the Philippines on January 2013. As of December 2012, it was not expected to arrive until March or early April 2013 because the installation of the new engine needed to be completed. This schedule was again moved to 3rd week of June 2013 due to prolonged training of its crews and additional upgrades and refitting works. The ship departed Charleston harbor at 10:00 AM on 10 June 2013. She tested her Oto Melara 76mm gun off the coast of Florida on 11 June 2013, firing 15 rounds. She reached the Atlantic-side entrance of the Panama Canal and crossed its entire stretch on 17 June, and made a short refueling stop at Balboa, Panama on 18 June 2013. She continued to the US west coast and docked at San Diego Naval Base on 28 June 2013. The Ramon Alcaraz will continue her journey across the Pacific Ocean and is scheduled for port visits at Join Base Pearl Harbor-Hickam in Hawaii, and at Guam before reaching Manila by 3 August 2013. On August 1, 2013, Ramon Alcaraz entered the Philippine area of responsibility, and proceeded to the waters off Casiguran, Aurora on August 2 for welcome ceremonies at sea by the Philippine Navy, local government units and fisher-folks . She then traveled though the northern coasts of Luzon and proceeded to Bolinao, Pangasinan where she met by her sistership, the BRP Gregorio Del Pilar, and was escorted Subic Bay where her official arrival ceremony led by President Aquino was held on August 6. On Nov. 22, 2013, she was commissioned at Pier 15 in Manila’s South Harbor. After the low-key christening and commissioning event in Manila, she sailed to Tacloban City to transport about 200 tons of relief goods, water purification systems, and navy personnel composed of carpenters, masons, plumbers and electricians who will help rebuild the communities and serve as a command-and-control ship for the ongoing relief efforts due to the destruction caused by Typhoon Haiyan. The Philippines ordered new Mk 38 Mod 2 25mm stabilized remote-controlled gun systems and are expected to be installed on both ships of the class. PF-16, will undergo two-month dry-dock and repair before her commissioning on November. On January 6, 2014, Philippine Navy spokesperson Lieutenant Commander Gregory Fabic said that the Ramon Alcaraz will receive 2 Mk38 Mod 2 autocannons that will be installed by American armament specialists on the ship’s left and right sides to complement the quick-firing 76mm Oto Melara main gun. The ship will be fitted with such weapons on her homeport at Subic Naval Base and it will increase the capabilities of the vessel in handling targets that was too fast and too close for the 76mm gun. ^ Saunders, Stephen: Jane’s Fighting Ships 107th Edition 2004-2005. Jane’s Information Group Ltd, 2004. ^ “Gazmin assures Navy of brand-new gear, assets showcased on Navy Day”. Interaksyon.com. 2012-05-22. Retrieved 2012-05-22. ^ “US government to hand over second ship to Philippines”. Philstar.com. 2012-02-09. Retrieved 2012-05-22. ^ “AFP eyeing 2 more second-hand US ships”. ABS-CBN News. 2011-04-26. Retrieved 2011-05-15. ^ “History of USCGC Hamilton (WHEC-715)”. USCGC Hamilton (WHEC-715) official web site. United States Coast Guard. 2008-06-20. Retrieved 2008-08-08. ^ “WHEC 378′ Hamilton class”. GlobalSecurity.org. 2005-04-27. Retrieved 2008-08-08. ^ “WHEC 378′ Hamilton class”. Globalsecurity.org. Retrieved 2011-12-15. ^ “Philippines Acquires MK38 Mod 2 Gun Systems for Navy”. Defense Studies. 2012-09-06. Retrieved 2013-05-26. ^ “Navy Capability Upgrade Team Inspects New Ship”. Philippine Navy – Naval Public Affairs Office. 2011-11-08. Retrieved 2011-11-10. ^ “2nd US warship sold to Philippines also stripped of guns”. Inquirer.net. 2012-05-22. Retrieved 2012-05-22. ^ “Philippines’ second warship to be named Ramon Alcaraz, World War II hero”. Interaksyon.com. 2012-05-06. Retrieved 2012-05-22. ^ “Decommissioned Coast Guard Cutter Dallas being transfered to Philippine navy”. The Digitel Charleston. 2012-05-18. Retrieved 2012-05-22. ^ “Cutter Dallas officially turned over to Philippines”. ABC News 4 Charleston. 2012-05-23. Retrieved 2012-05-23. ^ “AFP CHIEF TO RECEIVE 2ND US PATROL SHIP”. Balitang America – ABS-CBN International. 2012-05-18. Retrieved 2012-05-23. ^ “Phl spends $15M on 2nd US Hamilton-class cutter”. Philstar.com. 2012-10-08. Retrieved 2012-10-16. ^ “Arrival of new PH navy ship pushed back”. ABS-CBN News. 12/03/2012. Retrieved 24 January 2013. ^ Romero, Alexis (2013-05-04). “Arrival of new Phl warship delayed”. PhilStar.com. The Philippine Star. Retrieved 2013-05-26. ^ “BRP Alcaraz to arrive in PHL on Aug. 3 — DFA”. GMA News. 2013-07-04. Retrieved 2013-07-04. ^ “Maiden voyage of PH’s most capable warship”. 2013-11-22. Retrieved 2013-11-30. ^ “No. 721-12 Contracts”. U.S. Department of Defense Office of the Assistant Secretary of Defense (Public Affairs). Retrieved 2012-09-09.
i like to ride this boat!! !